What version of PB are you using as I have a custom 2D / 3D starfield library that you can draw on a canvas gadget? You don't need to use the Epyx FX library with this library. It's only for x86 at the moment but I can easily recompile it for x64. Attached is your compiled code with both variations. I can put tegether a sample piece of code if you want to use it. i'm using PB 5.42 LTS x86 , can you provide a snippet to see how to implement it ? I don't have the Epyx library set up on my PC anymore so I can't test your code but here's the starfield canvas library attached with you previous modified code as an example. Just rem out the bits you want for either 2D or 3D. Put the library in your purelibraries\userlibraries folder and restart the compiler. It's just a case of creating a canvas gadget and specifying the number of stars and the speed. The starfield routine runs in a thread so it never disappears when you drag the window around or open a file requester. I do see a problem if you release our patcher though. You will have to distribute the fmod dlls with the exe. You could use the built in PB commands though to use the Modplug format files like XM. CreateThread(@Draw_Threaded(),0) ;-draw it inside a thread. You can use BindEvent but it does flicker a bit. Delay(1) ;-give some time back to other windows. 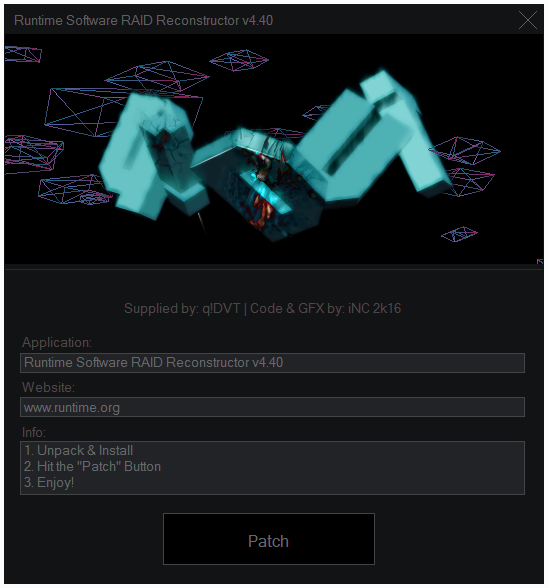 in 2016 i have done a patcher for DVT ( not the finest code but good enuff )... you can use the Form if you like it. It's all included in the attached rar file.